Palm Sunday C Sermon: Hosanna, Jesus! But it’s not only addressed to believers new to the faith or new to life itself. This verse also benefits mature Christians who’ve been in the Church for many years. What is this “milk” that Peter encourages us to crave? Nothing other than the Gospel — God forgiving sins for the sake of Jesus Christ. Truly, we can say that Christ Himself is this nourishment as we receive Him in Word and Sacrament. The fulness of true theology can be weighty and sometimes confusing. But God still moves us to nibble, chew on, or dig in to the meat of His Word. However, the most complex doctrines cannot be swallowed unless we wash them down with the pure milk of the Gospel. And in times of trial, doubt, and worry, sometimes the milk is all we can take in — yet it remains ever enough for our needs. Audio: Click to hear the MP3 of Baby Food. 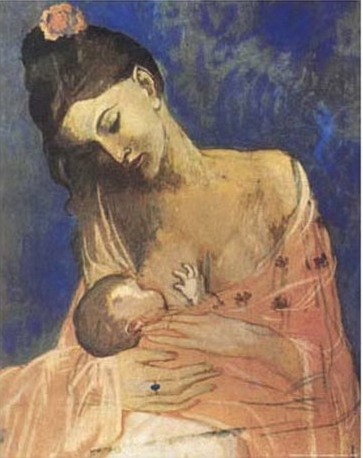 Illustration: Detail of Maternity by Pablo Picasso (1905). *The introit is a set of verses sung responsively at the beginning of the service. Normally, it is composed of portions of selected Psalms. The antiphon is sung at the beginning and end of the introit and — as happens today — may be from a Psalm or can be drawn from other parts of Scripture or from ancient liturgical texts.